This week has been the week from hell and I am just hoping the spinal block I had on Thursday will improve my condition enough to enable me to enjoy the great outdoors until I have my operation. The world looks so beautiful at this time of year and I am missing so many great opportunities but I have noticed small improvements since then so I remain hopeful. Whilst I was sitting outside enjoying some of the sunshine I enabled the help of Flopsy to do so weeding, well she does have to earn her keep :) . Have a wonderful bank holiday weekend everyone. Lovely! I used to have a rabbit when I was younger. Ouch to the spinal block. That sounds Realtek painful but I hope it works for you. Flopsy has he most beautiful coat. Such a cute bunny! 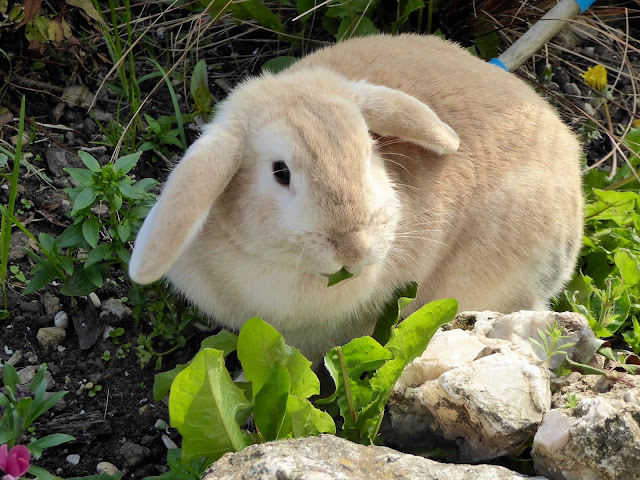 Flopsy looks wonderful, such a happy bunny, I hope your operation goes well and helps you to get out and about. Very cute. It must be lovely to have help with the weeding, although I'm in a constant battle with slugs and snails on my veg so I don't think a rabbit would help! Hi Cathy, I love bunnies and Flopsy is the perfect name for a bunny. Getting her to earn her keep is a must, especially whilst you can't get down and weed. She doesn't look as if she's struggling though. Hope you have your op soon.